The introduction of digital technologies in the mid-nineties was experienced in architecture in a rather peculiar way. While almost every architect adopted computers as the main platforms for their work, the term ‘digital architecture’ still refers almost exclusively to an architecture made of round, sinuous or continuous forms. But regardless of angularity or rotundity the introduction of digital technologies implied much deeper transformations in the modes of production of architecture, to an extent to break the consolidated categories which ruled architecture for the past five centuries. This is the thesis of Mario Carpo’s last book The Alphabet and the Algorithm (Cambridge, MA: MIT Press, 2011) which was discussed in a seminar titled ‘The Rise and Fall of the Albertian Paradigm,’ held at the Berlage Institute on January 27th, as part of the seminar program ‘The Historical Project. 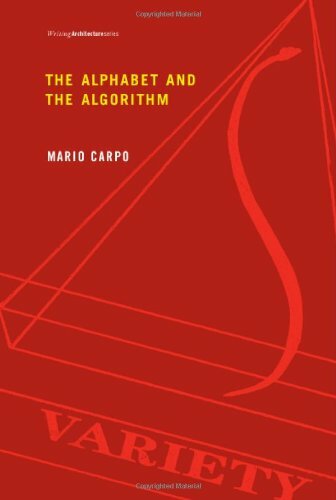 Whatever Happened to Operative Criticism?’ Regarding the general theme of the program, Mario Carpo’s impressively coherent research trajectory is particularly interesting because it declines a rigorous historical research as a punctual present-day critique. Tracing the genealogies of different modes of production in architecture, Carpo is able to locate the digital turn in a long-duration perspective encompassing not only the architectural problems of type, models and imitation, but also broader political issues concerning authorship, labour and the state. It was Leon Battista Alberti who formalized architecture as we know it today—or, as we used to know it until today: an “allographic, notational and authorial art.” Alberti was addressing a social and economical crisis that was hitting Florence, which made the realization of large public works almost impossible. To face this problem, a new strategy for organization of the building site had to be elaborated. According to Alberti, a building should be composed in the mind first. Then, the idea of the building must be translated into a graphic, standardized code—plans, elevations and sections. The product of this operation is the design, which has to be transmitted to someone else to be mechanically executed, in strict conformity to the drawings. This procedure ensures that the architect is the only responsible for the design, its only author. To impose this new method, Renaissance architects had to struggle against a building industry that was dominated by social and technological conventions connected to a very different model of organization of the building site. In the Middle Ages guild system, a building was never designed beforehand. The moments of ideation and building were not separated, and the building process was a collective effort in which every workman applied the secret knowledge he literally possessed as a member of the guild. The introduction of digital technologies in architecture marked the resurgence of some of the characters of the medieval building industry. While digital manufacturing tools virtually remove the distinction between the architect and the builder, digital networks facilitate the participation of different subjects in the design process. The participatory possibilities offered by digital technologies produced a great wave of euphoria in the late nineties-early two-thousands. Today we can fully appreciate the ambivalence of the transformations of labour in the digital era. While it is true that labour has become more collective and participatory, it is also true that digital technologies allow a centralized control of the outcomes of this participation. This is the case of the recent developments in Building Information Management (bim) platforms. As Carpo declared in a recent comment on his book, “the new digital workshop … looks less and less like an incubator of new forms of participatory creativity, and more and more like a playground of corporate interests, bureaucratic opaqueness and technocratic megalomania.” For sure it is clear that the ‘digital turn’ did not improve architects’ working conditions, which on the contrary followed the general trends of labour precarisation. A digital design does not (only) consist of drawings (plans and sections), but also of codes and algorithms. If a drawing is a scaled, faithful representation of the final object, a code does not represent any particular object, but rather it is a generic description of a family of objects. A digital code can operate like a function that can generate many forms according to the values attributed to its parameters. The value of the parameters can always be assigned by the designer, but it might also happen that the parameters represent certain environmental variables, or that the final users will be asked to set the parameters to customize the final product according to their personal needs. Different objects produced by the interpretation of the same algorithm will generate objects that are similar to each other, but never identical. Identicality and similarity are indeed the opposed inherent logics of the analog and the digital paradigms. Analog reproduction is based on the mechanical imposition of a physical matrix or mould on a certain material, to produce identical objects. The more objects are produced, the less the price of the individual item, as the cost of the original mould or matrix is amortized. Digital production—as in digital printing or manufacturing—does not need a matrix to be produced. The production of identical copies is still possible, but it does not have an economical advantage over the production of different objects. To use a Piercean jargon, a mould or a matrix is an index of the items produced by it, while a computer code share a symbolic correspondence to the individuals it can generate. Again, while the former approach is characteristic of the modern times, the latter shares many similarities with the medieval cognitive and aesthetic landscape. Carpo corroborates this argument citing two canonical sources. In his “Introduction to an ‘Iconography of Mediaeval Architecture’,” Richard Krautheimer asked himself why many medieval buildings that where meant to be copies of the Saint Sepulchre where in fact so much different for a modern beholder, concluding that similarities were to be sought not into visual but rather into symbolic or socially conventional contents. Similarly, in his Gothic Architecture and Scholasticism Erwin Panofsky noticed an analogy between Gothic architecture and the top-down organization of Scholastic knowledge into categories arranged from the most general to the most particular. If according to Marx any production is also a production of subjectivities, then it is legitimate to ask what are the subjects of analog and digital production. In other words, we have to see the political consequences of the two paradigms. The rise and the fall of the nation state parallels the rise and fall of the production of identical copies. As Carpo notes, the very term “standard” has a military etymology: the French word étendard refers to “a banner that identified a group of armed soldiers.” Standardization is also a presupposition for an efficient state bureaucracy and a tax collection service. The bourgeois class—the body of the modern state—espoused standardization not only as an efficient management device, but also as an ethics as well as a style. The future looks indeed medieval. This is not necessarily negative. What we must acknowledge is that our political landscape was made for peoples, masses of identically produced subjects, and that perhaps it is no longer appropriate to the times we are living. How can architecture help us to construct institutions for a multitude of different individualities?